Ready for the next round? Drink tickets help you sell refreshments in advance, reward your loyal patrons, and take the pressure off your hard-working bartenders. 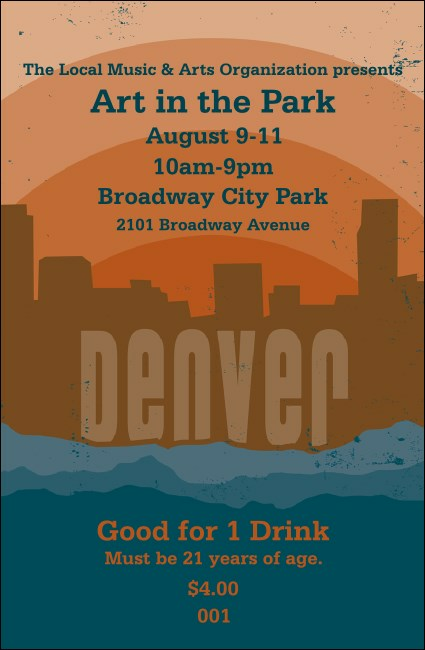 This Denver Drink Ticket, with space to upload your organization's custom image, matches the rest of our Denver publicity material templates and celebrates the city that claims to brew more beer than anywhere else in the country! Enjoy your own celebrations more when you let TicketPrinting.com take care of the details.